On this webpage you will find detailed information on how to connect to an RTSP camera device with your Windows Forms/WPF Application written in C#. To implement this example, you need to have OZEKI Camera SDK installed, and a reference to OzekiSDK.dll should be added to your Visual Studio project. How to connect to an RTSP camera device using C#? In order to connect to your camera device with the OZEKI Camera SDK you need to use the classes of the SDK whose objects have been declared at the beginning of the Form1 class. After this you should initialize these objects in the constructor of the form ( it is possible within the declaration statements as well). The final steps are to call the method named SetVideoViewer() and to add your VideoViewerFM object to the control collection of the panel that you can see on the GUI. Important: you should study this article in order to find out how to setup your Windows Forms Application correctly. _camera = IPCameraFactory.GetCamera("rtsp://192.168.113.150:554/ufirststream", "root", "pass"): this method initializes the camera device that has been declared as a private member of the class. The used arguments are the following: The first component is the adress of the camera. It must be an RTSP (Real Time Streaming Protocol) camera which is marked by the, rtsp:// opening and followed by the URI (Uniform Resource Identifier) containing the IP address of the device, then its port number and stream identifier. The second component is the username and the third is the password for the camera. _connector.Connect(_camera.VideoChannel, _imageProvider): This method establishes the connection between the image that we recive from our RTSP camera and the image provider object which is used for displaying the image of the camera on the Graphical User Interface. _camera.Start(): you should use this method in order to receive image from the camera. _videoViewerWF1.Start(): by using this method the image on the GUI will be displayed. After the successful implementation of the functions and the GUI elements, the application will work properly. 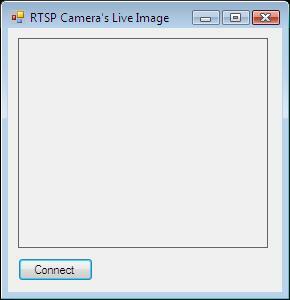 By pressing the connect button the image of the RTSP camera will be loaded in. In order to connect to your camera device with the OZEKI Camera SDK you need to use the classes of the SDK whose objects have been declared at the beginning of the MainWindow class. After this you should initialize these objects in the constructor of the window ( it is possible within the declaration statements as well). Important: you should study this article in order to find out how to setup your WPF Application correctly. _camera = new IPCamera("rtsp://192.168.113.150:554/ufirststream", "root", "pass");: this method initializes the camera device that has been declared as a private member of the class. The used arguments are the following: The first component is the adress of the camera. It must be an RTSP (Real Time Streaming Protocol) camera which is marked by the, rtsp:// opening and followed by the URI (Uniform Resource Identifier) containing the IP address of the device, then its port number and stream identifier. The second component is the username and the third is the password for the camera. _connector.Connect(_camera.VideoChannel, _drawingImageProvider): this method establishes the connection between the image that we recive from our RTSP camera and the drawing image provider object which is used for displaying the image of the camera on the Graphical User Interface. videoViewer.Start(): with this method the image on the GUI will be displayed. You should add the OzekiSDK.dll and System.Drawing.dll to the references of the solution. What's the difference among USB camera, RTSP camera and ONVIF camera? In the case of USB camera we do not need camera url and some functions(like moving, zooming, etc.) are not available. In the case of RTSP camera and ONVIF camera there are more available functions. The difference between the RTSP camera and the ONVIF camera is while the RTSP camera can have only one stream at a time, the ONVIF camera can have multiple.